(1) Henge proliferation. Now a huge ritual arena has been discovered near Stonehenge. You almost end up thinking Stonehenge, which used to seem quite big in itself, was nothing but the cherry on top…. (2) This unnaturally leads us to Dr. Faustus AU’s The Call of Cthulhu – for beginning readers at Deviant Art. (3) I sure didn’t score very well on Revolvy’s The Batman 1960s TV Show quiz. Must have missed more episodes attending choir practice than I thought. (4) You won’t need an alarm to wake up once you have the spider clock – you’ll be too scared to go to sleep. 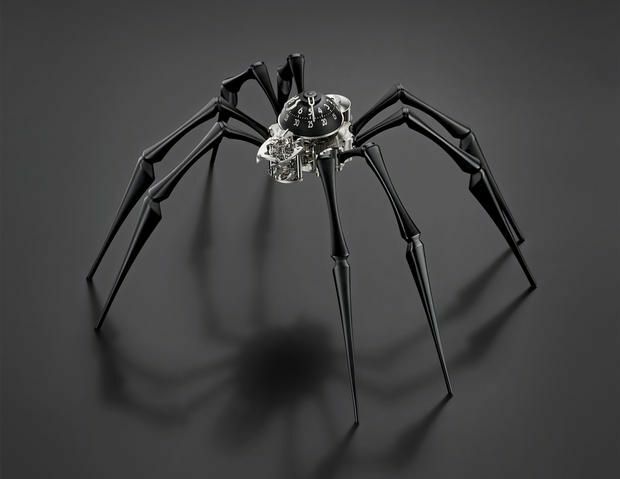 In Arachnophobia, the clock has been reimagined as the body of a spider, its mechanical movement engineered to sit partially outside the body as the spider’s head, where it can be viewed and admired as it sits on a table, or mounted to a wall. (5) Idaho Public Radio offers advice for writers from science fiction author David Levine. David D. Levine is the author of the upcoming novel ‘Arabella of Mars’ (Tor 2016), as well over fifty science fiction and fantasy stories. His story “Tk’Tk’Tk” won the Hugo Award. We spoke with Mr. Levine at the 73rd World Science Fiction Convention in Spokane this August, and asked him what advice he had for aspiring writers. “Persistence is the only thing you cannot do without,” he said. Though I’m a bit disappointed with its 1960 Worldcon report — [September 6, 1960] The 1960 WorldCon in Pittsburgh! The primary purpose for a convention is to allow fellow fen (plural of fan) to mingle. Gordon Dickson likens it to a Gentleman’s Club where adventurers can meet and compare notes before heading off back into the wild. Fred Pohl calls it a family gathering. It looks like the demographics of fandom match that of publication: women are in the distinct minority, but they are present and often outsizedly significant. Not sure what the point is of a report that doesn’t acknowledge the names of anybody but the pros (not even all of those pictured are named). If somebody is writing a throwback account of everyday life in the genre, I’d expect to see more evidence of research from sources that aren’t available online. Harry Warner Jr., anyone? (7) Brandon Kempner at Chaos Horizon has worked up a new estimate of the number of Sad and Rabid Puppies based on the 2015 nominating data released at Sasquan. 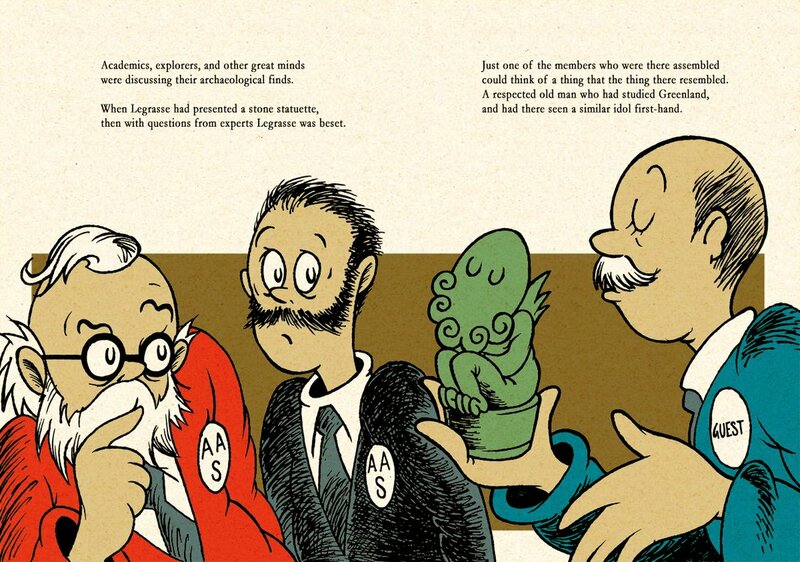 (8) Django Wexler has coded an E Pluribus Hugo simulator. (9) I like Joe’s attitude. (10) Chuck Wendig has found the silver lining in all those one-star reviews people have dumped on his new novel Star Wars: Aftermath. (11) Police are circulating the photo of a person of interest in a sexual assault at Dragon Con this weekend. Atlanta police are asking for the public’s help identifying a man who may be connected to a sexual assault at the popular sci-fi convention Dragon Con. Police also released a photo of the suspect. Further details about the incident were not immediately available. Dragon Con draws tens of thousands of people to Downtown Atlanta each year, many in costumes and other paraphernalia celebrating comic books, movies and pop culture. This year’s festivities began Friday. Anyone with information about the alleged assault or the person of interest is asked to contact Detective R.C. Sluss at 404-546-4260. Tipsters can also remain anonymous — and be eligible for rewards of up to $2,000 — by contacting Crime Stoppers at 404-577-TIPS and crimestoppersatlanta.org. This entry was posted in Pixel Scroll and tagged Brandon Kempner, Chuck Wendig, David Levine, Django Wexler, Dragon Con, Joe Peacock by Mike Glyer. Bookmark the permalink. I’m mostly an auditory learner but I used to take notes. Although my notes were a wild mix of doodles (good if you want to concentrate on just listening and don’t want to look as if you’re sleeping) and a weird combination of written notes mixed with mind-mapping-style diagrams. As much as I rely on computers these day I can’t imagine using a laptop or tablet for note-taking as that would be too distracting from actually listening (the sound of the keyboard would be yet another distracting). @cassy b: The problems you’re dealing with can be solved by tweaking the attributes of whichever appropriate tags. I’m not sure what level of CSS experience you have, so holler if what I’m writing isn’t helpful enough. The “1em” bit is what specifies the amount of whitespace to insert at the beginning of the first line. An “em” is typographer’s jargon for “how wide a lowercase letter ‘m’ is”, and the exact value of an em depends on which typefont you’re talking about. So text-indent of 1em gives you whitespace equal to a single lowercase ‘m’; 2em gives you whitespace equal to a pair of lowercase letter ‘m’s; and so on. I used ems here, but pixels or points would work just as well. So if you’d like to nail down everything in point-based measurements, that’s totally okay! Screw Stonehenge. The most fascinating neolithic site is Göbekli Tepe. I really like the sound of iZombie, but it doesn’t seem to have made it to the UK yet in any form. I hope it gets released in plenty of time for nomination watching, but after how long it took for Agent Carter to get here I’m not too hopeful. While the Rev Bob is barging into publishers, fixing their code, can he remind them that HTML thus epub deletes extraneous spaces and paragraph marks, so an author can’t shift scenes just by hitting enter three times for a bit of extra white space. I mean, is having a line with three centered asterisks too much to ask? Christian Brunschen, Rev Bob, et al — Thanks! I retract my threat of violence to the staff of Google (for this sin, anyway). JJ — Sorry, i was feeling grumpy with the worn-out clockwork on my 1st Gen iPad, and I’m no good at puns anyway. Cassy B — By odd coincidence, the book I bought was Graydon Saunders The March North. I was recommended A Succession of Bad Days, but I thought I ought to read TMN first, if they’re a series (not sure if they are, or just the same world). @Meredith: Allamagoosa (the story I linked to regarding the danger of typos) seemed extra appropriate: it was written in 1955 by Eric Frank Russell – and was the very first short story that won a Hugo. NelC, March North and Succession are certainly set in the same universe, and Succession follows March North chonologically, but there’s little overlap between the books (the Really Scary Powerful people are the same, but they’re not point-of-view characters). But I did read them in published order, so although I think one can be read without the other, I’m not absolutely positive. That last line is the really fiddly bit. It tinkers with the margins around the letter to create a small space to the right and shave some space from the top and bottom. Those are experimental values that work well for me; YMMV. You’d call that with a <span class=”dropcap”>T</span> expression, to make the “T” a dropcap. Not to start a flame war, but the choice of units matters more than you allow. For instance, specifying an indent in pixels or points (or inches, centimeters, or other such “absolute” units) may look fine to you on your device with moderately-sized fonts, but it’s going to break for someone who bumps the size up a few notches for comfort… because the font will grow and the indent won’t. It’s an accessibility issue. Take an extreme example and suppose you set your blockquotes to indent by half an inch on either side. How’s that going to look on a phone versus a widescreen monitor? My professional advice is to use em units (or semantic keywords like “small” or “larger”) for text and pixel units for images. Remember what you’re measuring and why. Thanks for the pointer to Lords of the Sea. Like Latitude, it’s a captivating deeper dive into a story that I kind of knew but didn’t really. Who’d have thought that triremes were basically sewn together? (Ob computer reference: the Cray supercomputers of the late 80s had backplanes that were essentially knitted). Seeing the island of Naxos reminds me of the Greek myth Ariadne and Theseus. After killing the minotaur, they wound up on Naxos in an enchanted sleep, where Dionysus reclaimed Ariadne. This was memorialized by Richard Strauss in his opera Ariadne auf Naxos. What’s it worth to you people for me to stop? @Rev. Bob, thanks! Added to my handy-dandy reference page. At least you didn’t tape the pennies to bricks. I appreciate that. In the bar-band phase of my misspent youth, I played dives where people routinely threw beer bottles at the stage. If they liked you, they drank the beer first. That scene in Blues Brothers? Only a slight exaggeration. Rick K, I love that movie; it’s like a love-letter to my home town. This is a little personal, but I feel like we’ve gotten to know each other now, and it’s the rare case where SF/F invades real life, so I thought it worth recounting. I love my girlfriend very much, but she has a jealous streak. In particular, any thought of my ex-girlfriend, Mara, sends her into flights of rage and fear. Mara and I were very much in love when I lived in Ocean City, Maryland, but when I moved to New Mexico for work, she had to stay behind. My girlfriend has always been half convinced Mara’s going to show up and take me away, just like that, despite my repeated assurances that that wouldn’t and indeed couldn’t happen. To be fair, even less jealous lovers would have trouble accepting the reason why this was out of the question. For Mara – I am speaking literally here, not metaphorically – was an Ocean Spirit, a nymph of the sea, capable of taking human form for a time but ultimately tied to her home element. You can imagine my girlfriend’s reaction to this explanation, but it’s true. Or so, anyway, Mara claimed it to me. So imagine my shock a few days ago when Mara appeared without notice at the fast-food outlet where I have a franchise, looking as lovely as ever, if perhaps a little less damp than my memory of her owing to the local climate. My first thought was that I was in big trouble: my girlfriend would think I had been lying this whole time. How was this possible? Could Mara herself have been less than candid? And yes, I felt the old stirrings. Over two-piece combos and peach iced teas, Mara explained. She had petitioned Neptune himself to become fully human, to renounce her elemental heritage so that she could join me, her one true love. I asked if there was some kind of cost for that boon; she simply said it didn’t bear discussing. I won’t try to tell you nothing happened between us. Mara and I were once as close as two beings of our different natures can be, and we had been apart for many months, and what she’d done to reach me was damned flattering. But by the end of the weekend, we both sensed that it was not to be. I loved my current life with my girlfriend, and Mara herself admitted that, on the long journey out West – because Neptune did not grant her identification documents that would stand up to TSA scrutiny – she had herself changed. She was no longer who she had been in our carefree oceanside days. We agreed we could still be friends, but our romance was at a definitive end. Still, there was the problem of my girlfriend and her jealous streak, especially if she discovered that Mara was no longer tied to the Atlantic, as I had assured her was the case. She would never believe me again. And perhaps I had my own doubts. Perhaps Mara’s story had always been a put-on, though she was a hell of a swimmer if you ever saw her, as I did many a night. Then I remembered: Mara had told me of the Salt Oaths that only those of the sea could swear, that Neptune himself vouchsafed if true, or struck down those who swore falsely. It was indeed by a Salt Oath that Mara had sworn her love for me in the first place. My own mere human oath in return seemed paltry and dry by comparison. And it was Mara’s Salt Oath that she asked me now to release her from, which I gladly did. But it occurred to me that the Salt Oath offered a solution to my problem. If my girlfriend would not believe me, perhaps she would believe Mara if she spoke directly to her, and assured her, by the power of Neptune himself, that Mara’s and my romance was a thing of the past. That was wonderful. And by wonderful, I mean an assault on humor and human decency. Good job! Got any more? Jim Henley: “If you were Undine, assure my love”. Woot! Very much seconded. I love that show. And Jim, that is one of the shaggiest — or, I guess, soggiest — shaggy dog stories I have read in many a long hwhile. Jim, surely there’s traffic that needs playing in near you? Not to start a flame war, but the choice of units matters more than you allow. No flammability here! I deliberately avoided the gritty details of on-screen design, because oh my great Ghu, that stuff gets overhypercomplexificationated, and I wasn’t sure what level of fussiness Cassy B wanted to deal with. That’s why I opted to keep it simple by not even mentioning the other units the first time around. 🙂 We’re talking about text, so keep it in ems and everything’s cool. As for hypercomplexity, my ebook cleanups usually involve a hefty chunk of “you don’t need to specify that, so don’t!” editing. For instance, most books add a class to the I element, but the class’s only rule is “italicize this.” Kill it with fire! ObSF: A couple of years ago, I ended up on an ebook panel at a convention. One of the other panelists, a writer/editor, expressed the opinion that ebooks should be “tightly styled” (my term) to look just like the corresponding treebooks. I respectfully disagreed, citing a few of the ways that looser styling enhances accessibility. Being able to change font sizes is a benefit to be embraced, not a deviation to be squashed! To the iZombie fans: Have any of you checked out Diana Rowland’s “White Trash Zombie” novels? Very similar setup, enough that I initially wondered if one was ripping off the other, but it looks like coincidence. I haven’t read the iZombie comics, but I enjoy both the show and the WTZ books. Rev. Bob, I enjoyed the White Trash Zombie books. Should I check out iZombie? I’d say so. iZombie has more of a “middle-class zombie vs. big corporate bad” than WTZ’s “lower-class zombie vs. big military bad” thing going, but I started with the books and proceeded to enjoy the TV show.